I’ve written a book – Getting Started with Dwarf Fortress, coming to O’Reilly soon! It covers the current version and takes you from knowing nothing to being a confident Dwarf Fortress player! Workshops are a central feature of DF so lets get to grips with them right away. Workshops are places your dwarfs work, usually turning base materials into useful goods. The list of workshops can be a little overwhelming (“b” then “w”), but don’t worry, we only need to worry about a couple early on. First up we need a carpenter’s workshop, this workshop allows us to turn wood logs into furniture and other items. You should see a lot of wood scattered around in front of the fort, where the wood cutter has left it after felling trees. We have no wood pile for it to be moved to, you see. Move the view to the front of the fortress. Hit “b” for “build”, and then “w” for “workshop”. You can also just scroll down to “Workshops” using “alt+down arrow” and hit enter. You will now see a list of workshops. It scrolls off the bottom of the page (scroll around if you like)! Hit “c” for “Carpenter’s workshop”. The menu will vanish and the placement menu will appear. The green X’s mark out the workshop’s footprint. The dark green Xs are squares that will be impassible once the workshop is built, keep this in mind when building in an enclosed space, you don’t want to block the door! Chose a spot in front of the fortress. Somewhere round where mine is marked should do. Once you’re ready to place your workshop hit “enter”. At this point you could just hit enter and the first item on the list will be used to build the workshop. Instead, for fun, hit “x” and “expand” the view to show a list of every single item the workshop can be built from. Expanding the item selection is a nice way to chose exactly the item you want to be used. Most of the time you can ignore this option, but it will come in handy later on. Close the expanded menu with “x” again. For your interest note that items are sorted by distance from the workshop’s current location. Usually you want to build with the closest items to save your dwarfs a slow walk. Your workshop is now about to be built. You will have to hit space a couple of times to un-pause the game, but as soon as you do I bet you that a helpful wee dwarf will run over and start building it. If you’re quick you can hit “q” and see the status of the workshop, it should say “Construction initiated” or something similar. A few seconds later, the workshop is built! It doesn’t look like much, but it’s really useful! I promise! So lets get turning some of this lumber into stuff our dwarfs can use. Just don’t tell the Elves, ok? They really hate us chopping down trees. Pointy-eared gits, a magma-steam death is to good for them! They hate drinking water, much preferring booze. They’ll eat just about everything, mostly raw. I guess that makes us the owner of the worlds’ most complex homeless shelter! So lets make them work for their hot soup and institutional sheets! Hit “q” and move the cursor over the carpentry workshop. The menu on the right now shows you the actions you can take, specifically, we’re interested in “a: Add new task”. Note the right menu is now a large list of stuff we can make. We’re after beds. You can scroll down to beds using “alt+down arrow”, or simply hit “b”. The menu now changes back to the “q” list and you’ll see “Construct bed” listed. But we want more than one bed! Hit “a” again, and then “b”. Repeat until we’ve got five beds up there. We don’t need a bed for every dwarf just yet, luckily for us they seem happy to sleep in shifts. If your workshop menu looks like this, well done! Five beds are queued up and hitting space a couple of times will un-pause the game and set a dwarf working, building your beds. You may have noted that there are a lot of other workshop options available to us now we have items on the build list. We can “s” suspend any construction, set any item to be “r”, repeat built, or we can hit “c” and cancel the construction of the current listed item. We can also fiddle with the workshop profile by using shift+p, “P”, or have the entire workshop removed using “x”. For now, lets just watch the beds get built! Hit “p” from the main menu. hit “u” for “Furniture stockpile”. Move the X near the workshop, hit enter, and designate a pile about 5 tiles by 5 tiles. You’ll note the dwarfs have moved the constructed beds to the pile as well as some spare barrels, our anvil and a bag. As stated above, we don’t usually like to leave our stuff lying around outside, even in tidy piles, but as a temporary solution it helps keep things organised and gets the furniture moved from the workshop. If items aren’t pulled out from under the carpenter’s feet then eventually the workshop will get cluttered (marked with “[CLT]” when you “q” over the workshop) and a cluttered workshop works slower. Later on we can remove piles by using “p” and then “x” and selecting the whole area of the stockpile. What’s better is that helpful dwarfs will grab those items and move them to another suitable pile. But enough of that, lets get on with building our fortress! What kind of Dwarfs would we be if we only scratched around on the top of this mound like dirty hobbits? We want to dig down, down, down! The easiest way of doing this is to build some stairs. Well, to be precise, we’re going to designate some stairs using the “d” menu. We are going to designate some un-dug space to be stairs and then see what’s going on a few feet down. So follow along, and lets get expanding! Move the map to the bottom end of our corridor. Hit “d” and then “j” for “downward stairway”. Move the X into the black and hit enter, move the cursor down one, and hit enter again. You may be wondering why I have set two stairs down. The reason is that dwarfs need space to move past each other. If the corridor, or stairs, are only 1 wide, then they have to pause to let each other pass. This slows movement around your fortress down terribly once you have dozens of dwarfs running around. Two stairs down should be enough for now. To dwarves a down stair is just an exploratory stair dug down to see what’s on the level below. It’s like knocking a hole in the floor so you can look down on your neighbours in the flat below, hoping perhaps to work out what that strange moaning and banging was all about. Ok, so I used a drill, and didn’t literally knock the floor out so much as make precise holes all across their ceiling, and I didn’t look so much as hook up a fiber optic camera, but the principle is the same. Go down one level from our main area. At this level, below our down stairs, hit “d” and then “i” for “Up/Down Stairway”. Move the X over the two tan blocks. Hit enter, move down one, hit enter again. Two brown X’s now show that your up-down stairway has been designated. If you mess it up, “d” and then “x” can un-designate the space for you. Lovely! Two perfect up-down stairs. But we’re not done yet. Go down a level and build two more up-down stairs. Once you’ve done this, drop a level again and designate two upward stairways using “d” and “u”. You should end up seeing something like this once they are built. This is on level 142 141 (see top right for current level), or three levels down. If you don’t see stone, you’re on the wrong level! Rock! We’ve got some rock around us! This is the sort of place a good dwarf loves! How about we dig out some of this space? I suggest a long corridor running north some twenty squares, and we’ll make it three squares wide. Midway down this corridor we will have some stairs going down and some 15×15 size rooms on each side. Just a simple layout for now, but it will be enough for our needs for now. See if you can match mine. Now let your boys dig! Dig boys, dig! And make sure all your areas set to be dug connect back to your stairs! Along the way you may get various messages about striking various ores. That’s good news! Metal is very handy, as you can imagine. But we’ll worry about metal later. As you can see, underneath my X is a dwarf, some limestone, and a limestone cavern floor. I can use the alternate scroll (“alt+”down arrow”) to move through those three items, and hitting enter will display me some info about each. Ok, except for the floor. I mean, what do you want to know? It’s a floor! “Look around” is a very handy way to see what is in a square. Sometimes items get stacked a few deep and you’re not sure what is what, “k” will show you. Also, it is very handy way to find out what the walls and ground are made of. For example, without irrigation you won’t be able to build a farm plot inside on anything but soil, sand, silt, clay or loam. “Look around” will show you what the ground is made of. Yuck! This is the remains of some food turtles we brought with us on our journey. We can’t have this left lying around our tidy fortress, can we? Well, we could, but the end result would be a stinking cloud of purple miasma. Miasma makes our dwarfs unhappy. While they may never shower and probably reek to high-heaven, they really don’t like the smell of rotting leftovers. Go figure. So how do we get rid of the refuse? Easy! We build a “p” “stockpile for “r” “refuse”. But note, we need to build this pile outside or we’ll get miasma build-up. Outside, the wind blows the stink away. See if you can set up a refuse pile on your own like mine. It’s just like making any other pile, except we set “r” for refuse as we plot it. Look, one of my adorable wee dwarfs is moving rubbish there as we speak! Phew, miasma criss averted! Booze is the lifeblood of dwarven society. Literally so. Dwarfs, unless injured, will prefer to drink booze over water 100% of the time. If there is no booze, they will drink water, but that often involves dangerous trips to the nearest river, where deadly carp may end your dwarf’s life prematurely. DO NOT UNDERESTIMATE THE FISH! Dwarfs without booze also work slower. Like me. So what do we do about the dwarf booze demands? Simple! We build a still! Hit “l” for “Still”, or scroll through and find the still yourself, and hit enter. Place the still in the room next to the food stockpile, like this. Now to make it start churning out the brewskies! Hit “q” and move the cursor to the still. Hit “a” for “add task”. Hit “a” and “b” another 7 or so times. Yay! You have now queued up a lot of beer to be made. But you’re going to need to do something else to keep the booze flowing; you’re going to need to make barrels. Scroll down to “Make wooden Barrel”, or just hit “v”. Fill the queue with barrels. That should see your dwarfs produce enough booze to keep them going for a while. Repeat that process a few times or put “Brew Drink” and “Make Barrels” on repeat for five minutes. End result, happy drunk dwarfs! An important thing to note at this point is that brewing alcohol uses plants, but doesn’t destroy the seeds. Cooking does destroy the seeds of any plant cooked, which can seriously compromise your ability to grow more food! So for now, lets just stick to making some extra booze. We should be ok for food for a while yet with our farm running. Time to head back down stairs to see how our miners are going. Let them dig at least one room out before continuing with the next step. Hopefully they’re not sleeping on the job (The big “Z” flashing on them)! We need doors. Lots of doors. We need beds, doors, chairs, tables. We need lots of them. If you’re starting to feel like an Ikea salesman, don’t worry, when you see a bed menacing with spikes of cat leather, engraved with an image of a dwarf striking down a goblin with other dwarfs laughing, then you’ll know you’re no longer in Sweden (or any one of 36 other lucky, lucky Ikea countries!). So how are we going to get all of this wonderful furniture? Chose an area near our main stairs up, in one of our new rooms. You can check the shot below to see where I’m going to place mine. Select some stone and get the thing built! “q” over the Mason’s Workshop. “a” for “add task”, then “d” for door. Do this four times. “a” for add task, then “t” for table, do this twice. “a for add task, then “c” for chair, do this twice. Wee! Look at all that lovely furniture queued up! Soon our mason will turn up and start cutting blocks of stone into something more useful. Unfortunately, someone is going to end up trying to haul all that furniture up stairs to the furniture stockpile, and we can’t have that, so lets make a big stockpile in the middle of this room. While you’re at it, why not remove the furniture stockpile upstairs and get all of that stuff out of the rain. Go up to the pile, hit “p” for pile, then “x” and then hit enter at one corner of the outdoors furniture stockpile, and then move the cursor to the other end and hit enter again. Here’s my downstairs stockpile, complete with some just-moved furniture and some doors! Now it’s time to get those doors and beds into use, and when the tables and chairs are built, we’ll use those too! You may have noticed that our dwarfs have been sleeping on the ground when they get tired. This is really not much fun for them and we’d like to give them a place to stay. With some beds built, lets set up a big bedroom on the top floor so our dwarfs can get some shuteye. Head to the top floor, we’re going to build in the spare room. Hit “b” and then “b” again (for “bed”). Move the cursor and place a bed in the corner (hit enter, select a bed and hit enter again). Spread the five bed around the room. Hit “space” until we’re back at the main menu. Hit “b” again, and “d” for “door”. Place doors at each of the room entrances. Here’s my room layout. The shadowy beds and door show that the beds and doors aren’t placed yet. The green X shows me about to place the next door. Pretty soon the room will be laid out and we’ll be ready to use it to house our little workers. Here’s mine finished, doesn’t it look pretty? Move the cursor near one of the beds. It will start flashing. On the right, you’ll see the option “r: Make Bedroom”. You will now see a flashing blue square. Here’s mine, as selected from the bottom-left bed. Hit “alt+down arrow” and this will make the blue square bigger until it fills the whole room. Hit enter with the room set at max size, a new menu will appear on the right. This menu gives you options for the room. It will always appear when you “q” over the item you set a room’s use from. Note, you don’t have to set every bed in the room as a bedroom (although the game will let you do that). DF is smart enough to know that the room is a bedroom, and all the beds in the room should be used. Hit “b” for “Barracks”, this will turn the “(N)” to a “(Y)”. With the room set as a barracks any dwarf without their own room will use the beds in the barracks to sleep in. When you have a military, the barracks is also where dwarfs will spar and sleep when off duty. …a monkey ran into our fortress, probably planning to steal something, when it came face to face with our woodcutter (the sandy-coloured dwarf). End result, chop-chop, a dead monkey! The red “M” is the dead monkey, the other red stuff is the monkey’s blood splattered everywhere. Don’t worry though, your dwarfs will soon drag the body outside and throw it on the refuse pile. This may not happen in your game, but it’s good to know what a fight looks like when it does. That’s all for now! In the next tutorial we’ll build a fine dining room, set up some more workshops, and start to build some proper living quarters for our dwarfs. We might also build some fearsome traps! I can’t wait! good starter guide–you should link to this in the wiki if you haven’t already. I haven’t yet – thought it might be a bit cheeky. I had a look and couldn’t decide where to put it so instead I left a ‘discussion’ comment on the “Tutorials and Guides” page. If you know the wiki perhaps you’d like to link it up for us? Ta. This is such an amazing tutorial, it is helping me get back into the game after quite the long hiatus. I can’t wait till my dwarves are fighting off goblins and shooting magma out into a moat! But the dwarfs won’t use it as a bedroom yet. We have to specify what the room is to be used for first. This is not true. Dwarves will will sleep in any placed bed if they don’t have a bedroom. I’ve seen it happen in my own fort. You only need to mark out a room if you want to make a personal bedroom or a training room. You are correct! And I had noticed this too. I think there may be benefits to using a barracks over a random bed, but I am not exactly sure what those would be, happier thoughts? Perhaps no difference after all! Still, having a barracks there will be handy for later. Soldiers will live & sleep in the barracks if commanded to do so and will also spar there. My damn miners refuse top dig out an entire room! they leave it half done then move on! Yes, they like to eat, drink, look at tastefully arranged doors. You know, pointless things. Best to set only sections of rooms to be done at a time I find. Or wait. It’s not being built obviously. I have 5 idle dwarfs. What should I do? This happened to me, my craftsman was cutting wood instead of building. I just waited for him to finish then he built it. Do you know why it took a while? Just futzed around with it for a while. Seems like fun, but I’m guessing t will get more interesting with another six months or so of development time. When I dig down two floors and make my up stairs everything is red. I continued digging anyway and now my miners flash with Z’s. What is going on? Flashing “Z” = sleeping dwarf! Red digging probably just means you are digging through some red rock or dirt. 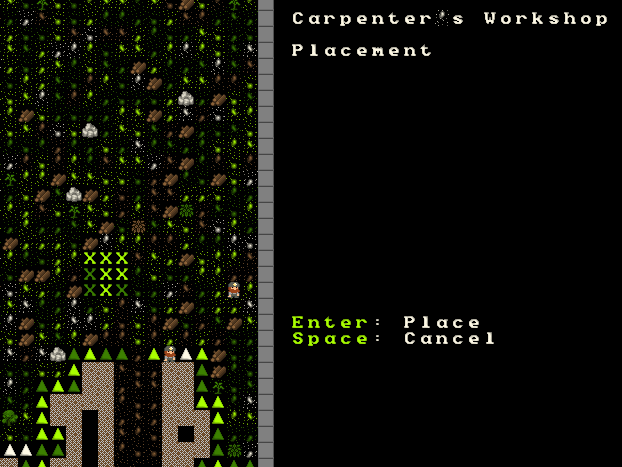 I believe that if you don’t mark it as a barracks then random dwarves will come sleep in the bed, but when they do they will claim it as they’re own. This means you need 1 bed per dwarf if you do it that way. I have the exact opposite problem: Too much stone. Dang! I mined out lvl 132 insted of lvl 131. You will have to be careful when you work on the magma tutorial, perhaps digging out a bit of space above the level you ended up working on, but other than that you should be fine. This is worrisome, as they don’t look that official or staircase like, like yours. What’s up? If they are showing up as an X it means you’ve dug an up-down staircase, not a down, or an up, which have their own icons. Probably won’t make any difference to anything – but you might have poked a hole in the ceiling. Don’t dump your shells and bones outside. They’ll decompose. You need to keep those critical resources inside, and only dump bodies and body parts outside. Hey, I’ve run into a problem while working through this tutorial. Nobody is building my mason’s workshop. When I select it in q mode it says “Needs masonry”. What do I do to get that workshop up and running? You need to look at your dwarves’ lists of allowed jobs. Hit v to scroll through dwarves and then use alt2 or alt8 to scroll the list. Jobs in gray are forbidden for this dwarf. In white, the jobs he will be doing. Perhaps you have no dwarves with the Masonry job on! There you have the aforementioned list. Actually nevermind, it just took forever for one of the dwarves to bother going there and building the workshop. If you have queued up a lot of tasks it will take a little while for them to get to it. If you’ve lost a dwarf, they may never! Later on you’ll learn techniques to manage the dwarf labor better. I was playing the tutorial and then i accidentally got a miner stuck underground. I abandoned the settlement and tried to reload, but there were no saves, only the maps. I spent hours trying to find the place from the tutorial but I finally gave up. Please help me! Reclaiming a fortress is kinda going to be a problem. You’ll need to go Wiki-up the process.. it might be a bit much to explain here. It may be better to start all over again if you’ve done an “abandon”. There is no reload. Dwarf Fortress defaults to iron man mode, so you can’t go back to a saved game. If you really liked that location, you can reclaim it. Either way, you’ll be starting over with a new group of dwarves. Well, now my mason’s workshop is built but no one will go work on it. My “stonecrafter” person is just sitting by the caravan doing nothing. Also, it seems that the same guy who does the tree chopping is also doing the carpentry? This is spreading it a bit thin, no? Hmm, if there are jobs queued up he should go and work, as long as there’s stone to grab as well. Unfortunately, it’s hard to work out what is going wrong from here, but you might be able to figure it out yourself by going to Part 6 (IIRC) to read about dwarf management. Also, in the event I was supposed to mine in 142: I tried that first, but there was nothing but red floor there so I forcequit and reloaded D= cause I thought I had the wrong floor. It appears the stone/ore/etc is all down on floor 141. /facepalm. Take note: It’s extremely easy to misread that part right after the picture where it says to go down and build more up/down stairs. Ouch! Sounds like you were on a real mission there. I’ll have a look and see if I can make things more clear. This is a good tutorial. Too bad I can’t save =<. The autosaves every season seem to work though. Just press ESC, Save will be in the menu that appears. i got up to the stage where it says to build the doors, tables and chairs. so i set the tasks in the mason’s workshop and its like dwarf canceled build table: needs non-economic stone…help? also on the tutorial’s level 142 there is rock everywhere, but in mine there is just silty clay. Damn… try droppng another couple of levels of stairs and digging out some space down, say, 5 or 6 levels? Without stone you won’t see doors etc built. I’m following this tutorial to get into DF… it’s helping a lot! But I think you do have a problem here with the part where we first dig stairs downwards. You say to dig 2 sets of up/down stairs between our starting area on 144 and our new, large area, then say “This is on level 142.” I think you actually expanded on level 141; that’s where all the stone is, and that’s the level that’s 3 floors down. Everyone having trouble finding stone is probably building on level 142. Crap, I think you could be right. I’ll update. you really should fix the mistake about shells and bones; they’re really useful to have, don’t produce miasma, and will disappear if you leave them outside. So how can i remove the stairs on 142? I don’t think being red is bad at all. It’s just the red type of rock you have dug in to, unless you’ve got some other sort of problem? How do i remove the stairs on 142?? I would like to know what version and or tile set you are using. My version/tile set looks like something from the days of atari where yours looks like super nintendo. why are they doing nothing?? Do they all have picks? You might have to check their inventories (see later tutorials). Only dwarfs carrying picks can mine. Early on this can be a problem as it is easy to lose picks, later on not so much as you can make them at a forge and dwarfs will go equip themselves automatically. hmm, wierd. The stairs show up as X es but they function as actual stairs…. Gah! Foiled by my own hand! You can, when you exit, save the current progress, but short of copying the DF folder to back it up you can’t make progressive saves, no. Yeah … what fun, and addictive, too. How do I get those turtle shells and bones back inside? I could wipe out the Refuse pile … would those tasty lil’ dwarves bring the crap back inside? Where do I go to select what goes out and what stays in and where do I store what stays in? I’ll have to check to see if there is a Pile: Raw materials. You can set individual permissions on a pile. You could, on the outside pile, forbid bones and shells, and then make a refuse pile inside that ONLY accepts bones and shells. The wiki might provide some advice on doing that, but I’m pretty sure I suggest how to access pile properties somewhere in this tutorial…. I love you tinypirate and would ask you for your hand in marriage if gay marriage was allowed in Florida and other states besides Cali. Thanks to you I can play dwarf fortress without thinking that trees and grass are font styles. oh btw, later in the game, will my dwarfs get to fight more ferocious monsters such as mudkipz or dragons? Possibly. It depends on the world (if any survived the early times), and I can’t recall for the tutorial map. Next version of DF will have heaps of that sort of stuff so keep an eye out for it. Really great tutorial. I was lucky to stumble upon it. I had a problem in this part that I could solve only by realoding… While doing the stairways, intead of placing the second updown I placed a dawn one by mystake and didnt managed to find the command to remove it. I tryed everything there in that menu but wasnt working. Another thing, I saw you found the perfect place to built the manson tough I had none due to the stones, the only way I could find to remove them from there was by using a command to Hide Itens. Is there another way or simply telling them to move it to another palce? Strange that I saw noone commenting over it since there are to many rocks. Also, do everything produced from workshops like the brewer are taken to barrels automatically? I builted 7 beers like suggested and 8 barrels but they werent really being removed out after the beer was produced. Maybe just 1 or 2 I didnt spotted. Was this right? I just wasnt sure if the beer was getting used; how many barrels would it take for those 7 beers? Rocks are ugly and annoying and clutter the interface but there is not much you can do about that, unfortunately. You can. Hide the rocks or you can dedicate a couple of dwarfs to doing nothing but making rock blocks. As for beer, hmm, check the wiki for how much stuff a barrel holds but it sounds like your problem is more that barrels aren’t being hauled away from the brewery. You might have to be patient or dedicate a dwarf to item hauling. Also, you might have to make a pile for drinks, if you haven’t already. If you don’t know what that means then read the rest of the tutorials! Good luck! Thanks, a pile for beer is exacly what I need.. I was often having to looks in between all barrels to see if im short on beer or not since a lack of it can be dangerous. I keep striking native platinum on floor 141 making it impossible for my dwarves to get on that level from 142. I’m not sure how hitting a metal stops progress? My dwarves absolutely refuse to make wooden barrels. My farmers are all standing around confused and my woodcutter is just chopping trees like an ent killed his family. How can I get my dwarves to actually notice the queue of orders in the workshop? Is there wood piled up? Do you have dwarfs with the carpentry labour? 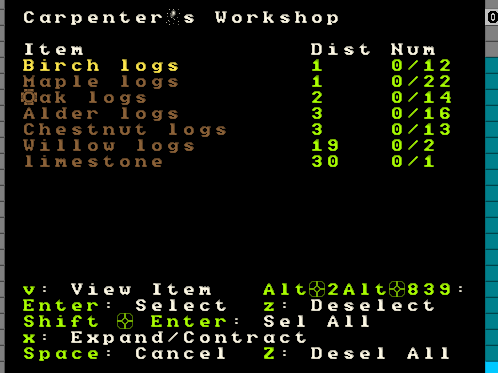 If it is your woodcuter you will need him to stop cutting to go make stuff (dwarf management is tutorial 6 I expect). As for the farms – did you “q” back on them and go through each season (“a”, “b”,”c”,”d”) and select plump helmets for growing? Thanks! I have updated it in the correct place, I think. I’ve come across a problem – a lot of my dwarfs seem to be going to the river to drink, and being ‘interrupted’ (sometimes fatally) by Pike. I don’t know why they’re traipsing over to the river as I have a still and have set up the jobs to ‘brew drink’ but it hasn’t been touched. I made barrels for it and everything! Have you got lots of spare, uncooked plump helmets or similar? Do you have the brewing labour on? You’ll need to sort that out and you may have so much food that barrels are being snapped up to be used for food storage before they get used to store booze – don’t overproduce food. Hehe. my Dwarfs will not dig anything on lvl 141, they made the stairs but wont do anything else. Same here, I’ve tried twice already, did everything else, made the up/down stairways, they do look like X’s, but when I reach the rock bottom, it builds the stairways but it just doesn’t mine or anything, they won’t even go downstairs.. any suggestion? Did you carefully designate the area around the bottom of the stairs without highlighting your new stairs? If you highlight your dug stairs with a dig order the bottom of the stairs will be cleared. I have no seeds D: How do I get them? Are you sure you don’t have Plump Helmet Spawn? As for seeds, you can just set your dwarfs to go and harvest plants (‘d’ and then ‘p’, from memory) on a big area outside and in due course your dwarfs will eat strawberries and other things and the seeds will end up stored. Has anyone cut down any trees yet? I had that problem too. The initial carpenter is also the initial woodcutter, meaning that he’l prioritize woodcutting instead of carpentering. You can probably set preferences, but since I don’t know how to do that, you’ll want to either select the woodcutting dwarf (v), go to the labour list (l), and deselect woodcutting. Or you can choose one of your lazy miners, do the same, and select carpentry. This should probably go into the guide. I’m guessing that you won’t get this problem unless you do as it’s asked on the first page of the tutorial, and set up more area for woodcutting. I set up a massive one. If they are dug – channel down on to them. If they are constructed they can be removed with the…. C or X or the key you use to mess with ‘constructed’ items. OK, I’ve got to thw part where you explain the stairs, but i can’t go down a level. i’ve built the stairs but when i press shift and > nothing happens?? Wtf. can you help me??? Probably a key binding issue. I would suggest hitting escape, checking key bindings, and trying to change the keys to go up and down a level to something else easy for you to use. Those bindings are buried on the second or maybe third page. sorry, can’t find it, whats the name of the key binding? Wish I could remember. The wiki has some info on the current control scheme http://df.magmawiki.com/index.php/40d:Controls ..this may help. Give it a go. I looked at your 6th chapter and apperantly, the settings u gave us were that the stonecrafter didnt have masonry on. Contradiction much, anyway, still need bedroom advice. I turned on masory, should i turn it back off? Don’t worry about overlapping bedrooms, the shape will adjust itself as you place doors and whatnot. In the end, it only really starts to matter with nobles and their ilk later on. They are demanding. Your peasants just like lying down off the floor. And thanks for the masonry labour tip, added a note to the top of the tutorial. Great tutorial, all is working for now, but I have a question. How do I know if there is rock in a level? Do I have to build up and down stairs, look at the wall and if rock, cheange it to up-stairs? Why does it matter if there is rock or not? Dig, dig, dig! If you’re not using my map or setup then I probably can’t help much – you probably haven’t got any seeds with you. If it helps every now and again he has a blue downward arrow beneath him? That means he is thirsty. Hmm. No idea why he won’t move home. Has he got injuries? Dig a fresh series of up-down staircases nearby and a passage to his location? I had the same problem as Ualati. One of my dwarfs died of thirst on the stairway. I figured out he was thirsty so I started building up-down staircases all around the place just underneath the down staircases on level 144. I had Xs everywhere down there, at least one of which should have connected to the staircases on the level above, but he just wouldn’t go upstairs. Strange. Was he in a strange mood at the time (flashing exclamation point)? Without seeing the build there isn’t much I can do. If there was a path to water or booze and he was allowed to go outside (under “o” for orders) and e wasn’t in a strange mood…. He should feed himself…. I must have made an error with the staircase that I didn’t know how to diagnose. I’m trying again and I’ll probably work it out. Thanks for the input though. I hit platinum while trying to build a staircase. Lucky?